Babesia bovis is a protozoan parasite of cattle. A protozoan is a single celled eukaryotic organism. It is important to note that they are not bacteria. Many protozoan species are free-living and exist everywhere on Earth. However, some species of protozoan are the most deadly parasites of man and beast. The disease malaria is caused by species that belong to the Plasmodium group. Malaria kills 660,000 people every year. For more on malaria go to the WHO website. Babesia bovis is a major parasite of cattle worldwide. It is transmitted by the tick. The parasite infects red blood cells, where it undergoes asexual (clonal) reproduction. This way a few Babesia cell can become many billions in a short space of time. 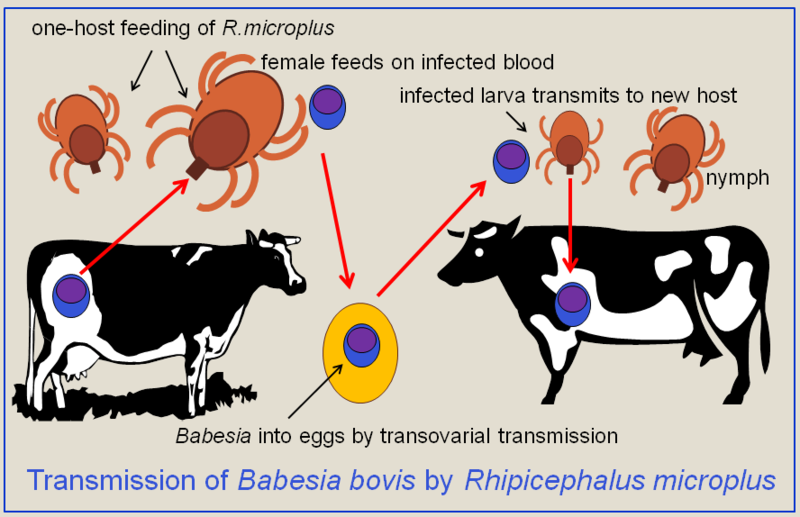 What diseases does Babesia bovis cause? The disease is called babesiosis, but it is known colloquially as Texas cattle fever or redwater. As more red blood cells become infected and destroyed the animal becomes anaemic, suffers debilitating fever and can die. What is the treatment for Babesia bovis? The drug Diminazene aceturate, also called Berenil, is effective at clearing a Babesia infection. It works by preventing the parasite’s DNA from replicating.